Since the year 2000 FS (Fashion Snoops) has been guiding leading brands and retailers on upcoming trends in the markets of fashion, accessories, home décor, beauty, licensing, and consumer products. FS provides long and short term forecasting spanning over the 24 months leading to each season. The service is being used by hundreds of companies in Europe, USA and Asia. Suitable for both small companies and large organizations. FS was created by experienced designers and merchandisers to bring practical inspiration to creative teams in fashion and licensing companies. The company's customers include H&M, L'Oreal, Perry Ellis, Skechers, Sony, Toyota, Victoria's Secret and many others. 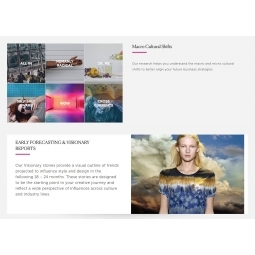 The modules cover areas like visionary (long term forecast), forecasting, retail, runway, trade shows etc. Fully interactive design tools including scrapbook, collage marker, high resolution downloads, PDFs, summaries, color references, dynamic zoom, vectorized sketches, original art and more. All FS subscriptions include access to CULTURE, a section that helps you understand the macro and micro cultural shifts to better align your future business strategies. CONTACT US FOR A PRICE QUOTE AND/OR A LIVE DEMO. Say hello to FS White Space. A brand new cloud-based platform wired for creative leaders to be inspired, collaborate, and present on-trend concepts. Some customer feedback and experiences on the FS service. Filmed at the FS Trend Immersion Day -event in New York City 8th May 2018.